Why Study Kung Fu at Shaolin? People frequently ask about where it is best to study Kung Fu. Many interested students feel that heading to Shaolin Temple, the birthplace of China’s Kung Fu tradition, makes the most sense. As many who have studied outside of China know, Kung Fu is usually taken very seriously by those who teach and study. Physical training is rigorous and is often accompanied by serious mental and philosophical exercises. If you're interested in learning Kung Fu at Shaolin because you want to go to the source, then by all means go. If you're interested in Kung Fu and Zen Buddhism, historically, then why not visit the area and even stay and study for a while? The first thing to understand is the geography. Shaolin Temple is located on the mountainside in the Song Mountains. Dengfeng is the nearest town and it is here that many of the Kung Fu schools are located. So be careful when you book your training and make sure you find out exactly where you'll be staying and training. You might think you've booked training inside the temple only to find out you've booked with the wrong school and are only ever allowed on the outside grounds. Training with Shaolin Temple itself - you can book directly with the temple (Shaolin Temple Kung Fu School) and they will organize classes and accommodation nearby. 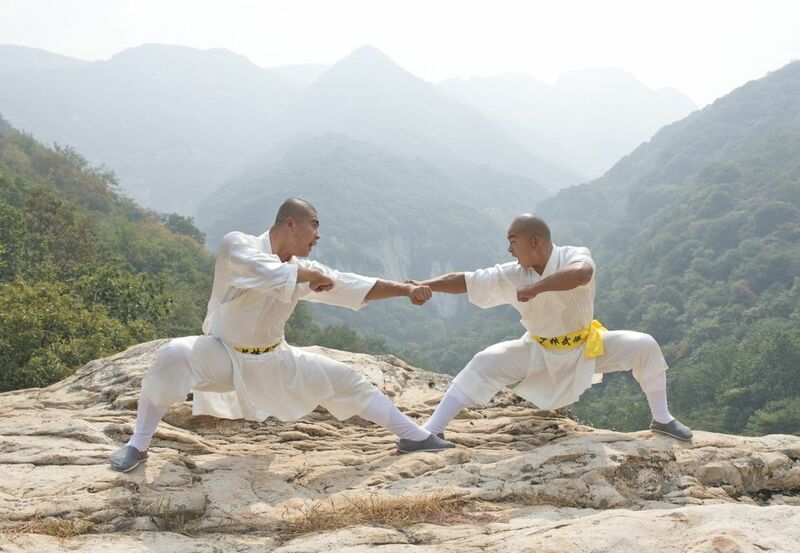 Traveling with a Shaolin Temple Branch group - Shaolin Temple has branches around the world and if you join one of the branches, you can travel to Shaolin with the branch group when/if they go. Training with the CK Martial Hearts, who organize small group trainings from June through October. The company organizes all accommodation, meals, training, clothing, excursions, as well as translators. Another source, bookmarialarts.com, can organize training and bookings for potential students, but be careful, as many companies claim to be the "only authorized company" to train on the grounds of the school. We would advise anyone seeking to study Kung Fu at Shaolin to make initial contacts through one of the means above, and then talking to former students who studied at Shaolin to make sure you know what you're getting into. This, of course, depends on you. Serious students can go and spend a year or even more. Upon reading the reviews on the Shaolin Temple Kung Fu School's site, students go for all different lengths of time. The training is flexible, you can extend your stay if you wish. So the only thing you need to ensure is that your Chinese visa is in order and your return airplane ticket is flexible. Training can be arranged for as little as one day (for tourists) and as long as a month/year or more for serious students. The schedule of a serious student is grueling. Breakfast is at 7 a.m. and at that point, you'll already have had an hour of Chi Kung and Tai Chi behind you. Then there's training until lunch, more training until dinner, and after dinner, Mandarin language class or acupuncture study or the study of Buddhism. Your body will be sore and your brain full but it seems like a pretty neat way to get a giant gulp of Chinese culture. Aside from Matthew Polly, who describes his immersion in Kung Fu training at Shaolin Temple in 1992 in his fantastic book American Shaolin, some Westerners who go to Shaolin Temple these days leave disappointed. There are mixed reviews. A French Kung Fu student who went to Shaolin to learn from the masters left after three months. He said the teachers assigned to the Western students are soft on the students and don’t believe these “Kung Fu Tourists” are really interested in learning, no matter how dedicated and eager you are. Western students are isolated in foreign student dormitories and it can be difficult to mix with local students. Additionally, stated the student, the other Kung Fu schools, of which there are many in the village of Dengfeng, at the foot of Mount Song where Shaolin Temple sits, look at foreigners as cash cows. The training is not as intense in Shaolin as it was in France, and the facilities are rather meager. On most days, the students trained outside in fields with thousands of other Kung Fu schools. It is no secret that the current Shaolin Abbot Shi Yongxin is interested in making money and expanding the Shaolin Brand. Nicknamed the “CEO Monk,” Shaolin under his guidance is in talks to brand tea drinks, set up a hospital, and expand into Hong Kong. The owner of CK Martial Hearts reminds all potential students of Kung Fu that the onus is on the student to learn, not the monk or trainer to teach. Students who show up with an "I have arrived. Please give me what I came for," approach will surely leave disappointed. Students who get the most out of any training, says the CK Martial Hearts owner, "are constantly the first to arrive, and are always the last ones to leave [a training session], the ones who only stop when told to stop, and who never ask what's next, but continually do what they've been told to, until they are given the next exercise or task."